A field experiment was conducted in 2015 to study the land surface energy fluxes from tropical lowland rice paddy in eastern India with an objective to determine the mass, momentum, and energy exchange rates between rice paddies and the atmosphere. All the land surface energy fluxes were measured by eddy covariance (EC) system (make Campbell Scientific) in dry season (DS, 1–125 Julian days), dry fallow (DF, 126–181 Julian days), wet season (WS, 182–324 Julian days), and wet fallow (WF, 325–365 Julian days). The rice was cultivated in dry season (January–May) and wet season (July–November) in low wet lands and the ground is kept fallow during the remainder of the year. Results showed that albedo varied from 0.09 to 0.24 and showed positive value from morning 6:00 h until evening 18:00 h. Mean soil temperature (Tg) was highest in DF, while the skin temperature (Ts) was highest in WS. Average Bowen ratio (B) ranged from 0.21 to 0.64 and large variation in B was observed during the fallow periods as compared to the cropping seasons. 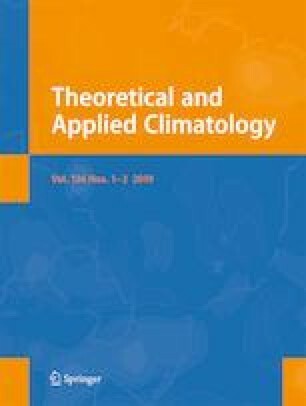 The magnitude of aerodynamic, canopy, and climatological resistances increased with the progress of cropping season and their magnitudes decreased during the end of both cropping seasons and found minimum during the fallow periods. At a constant vapor pressure deficit (VPD) at 0.16, 0.18, 0.15, and 0.43 kPa, latent heat flux (LE) initially increased, but later it tended to level off with an increase in VPD. The actual evapotranspiration (ETa) during both the cropping seasons was higher than the fallow period. This study can be used as a source of default values for many land surface energy fluxes which are required in various meteorological or air-quality models for rice paddies. A larger imbalance of energy was observed during the wet season as the energy is stored and perhaps advected in the fresh water. The work was partially supported by the grant of ICAR-NICRA and ISRO-SAC project. The authors are thankful to LI-COR Inc., Campbell Scientific Corp. (Canada), and MeaTech Solutions LLP for their technical assistance and support during the study. There is no conflict of interest to declare.